People are eager to learn how to use computers to get email, apply for jobs, and use the Internet. But their computers may not be working, they may not have Internet access and staff at their local computer centers may be too busy to provide one-on-one attention. 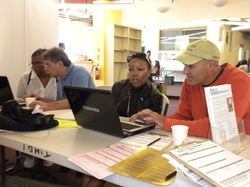 At our events, volunteers and certified technicians provide one session of free technical support and one-on-one computer and Internet tutoring in a small computer lab. We will also provide a hands-on opportunity for people to research Internet providers and learn how to save money. To volunteer for an event, sign up here. You will receive a confirmation email with training and event information one week before the event. What are the volunteer positions? 4. Performing simple repairs to existing personal computer equipment. Senior technicians will be available are present should you run into an issue you can’t solve. Appointments are made prior to the event and provide more information about the types of problems you may need to solve. Monitors, keyboards and internet access will be available on site. You may not be a computer expert, but you can use Microsoft Office and know your way around the Internet. You will work with people one-on-one to show them useful Internet resources and help them find answers online. Training and all materials are provided. We also need volunteers who can greet and welcome people to the event and help them find the services they need.